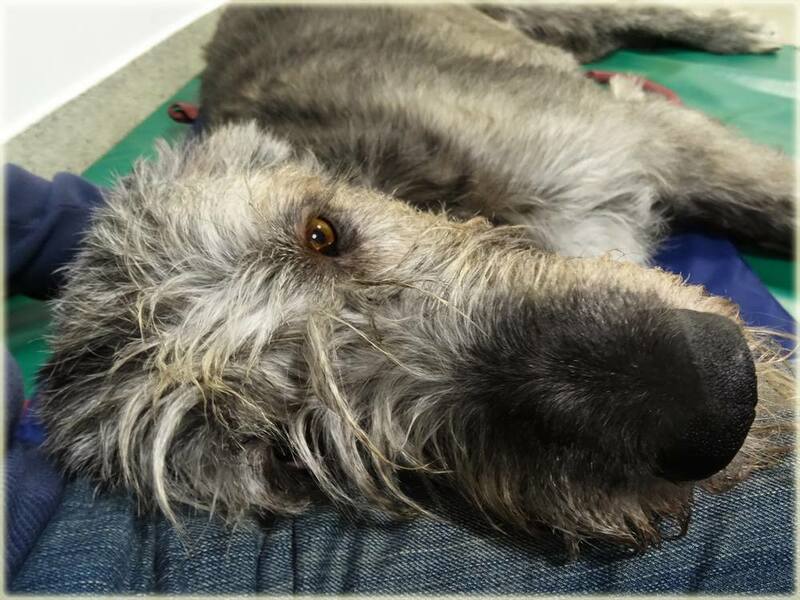 In April 2016, an appeal was launched on social media, to help Kathy Johnson (of the world famous Nellwyns Irish Wolfhound kennels), owner of Pollyanna. Polly had been at Noel Fitzpatrick's veterinary referral centre since mid-January, paralysed as a result of a trauma. A microscopic piece of cartilage had lodged in her spinal cord and it was not operable. She was treated with hydrotherapy and physiotherapy and although she showed some improvement it was very slow and she was still unable to stand. Kathy became more and more despondent as the weeks went by, as Polly’s progress was slow. It was heartbreaking to be faced with the possibility of losing her beloved wolfhound, who was the last in a line of Wolfhounds dating back some 35 years. Her close friends Gary, Elaine and Ann, had been helping in any way possible, visiting Polly weekly and trying to encourage her to get up. Polly was always very bright, alert, cheerful and loving - but she still could not stand. It was felt that she needed time - a lot more time, before she might be able to stand, but sadly, her vets could no longer care for her. Polly did not need any medical treatment, just time and further rehabilitation. As Kathy lives alone, it was not feasible for Polly to return home, as she needed to be lifted and turned regularly. It needs two, maybe three or four people to lift and turn a wolfhound. "Do you know of a canine convalescent home that Kathy could consider and where Polly might be cared for while she recovers? People in the wolfhound community do incredible things. We are praying that someone who reads this can offer assistance, or advice, or make a donation to keep her longer in care." Had PAWS been up and running on a nationwide basis sooner, we may have been able to do more than help raise money. We may have been able to get Polly into a dedicated rehabilitation centre straight away, or provide a team of helpers to assist Kathy at home. Of course - the outcome would almost certainly have been the same, but if there had been a framework already in place, the wheels might have been put in motion more efficiently. On the eve of what was intended to be the launch of this website, we received the devastating news that Polly could not be helped any further. The launch was put "on hold" out of respect for Kathy and her friends and family. Kathy's wish was that all the money donated for Pollyanna's care, be held "in trust" for similar cases. So PAWS dedicated a fund to honour Pollyanna and the generous people who donated to her cause. "Polly's PAWS" - was set up in memory of a brave and much loved companion. £1,500 was raised in just 48 hours = approx two weeks intensive physiotherapy and hydrotherapy at a specialist rehabilitation centre. Polly went to "the rainbow bridge" on 20th April.